Intelligent HP 82 Ink Cartridges provide vibrant, high-impact images and trouble-free printing. Getting a polished, professional look depends on high line and image quality. The patented, pigment-based ink formulation in the HP 82 Black Ink Cartridge is specifically designed together with HP printheads and your DesignJet printer to produce fine lines (minimum line width 0.04 mm) and high accuracy (+/-0.2%). Original HP inks produce the accurate, professional results you need, print after print, cartridge after cartridge. Get smooth colour transitions and more directly printable colours with HP 82 inks. 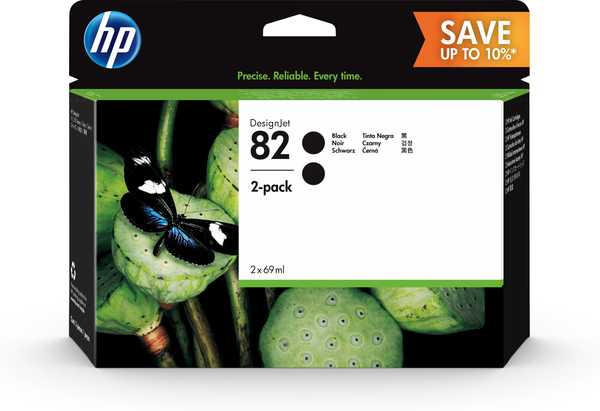 69-ml HP 82 ink cartridges are designed for cost-effective, high-volume printing. Individually replaceable ink cartridges allow for economical replacement of only the cartridge that needs replacement. And 69-ml ink cartridges keep productivity high by keeping interruptions for changing cartridges to a minimum. HP large-format printing supplies are designed to provide an excellent value for your high-volume printing needs. Ink levels are continuously monitored so you won't run out of ink unexpectedly. HP makes it easy to recycle the Original HP 82 Black Ink Cartridge. The HP Planet Partners program is a free, convenient and industry-leading return and recycling program for HP printing supplies available in more than 47 countries. Check your cartridge box or visit www.hp.com/recycle for details.